Need a display quickly? No problem. 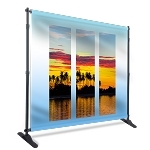 We offer a variety of products for trade shows that will get you up and running quickly. This product line offers high quality items, but due to the quick production we are unable to change fabric options, or sizes for you. The products are available per each individual description. And if you place your order by noon PST, your order will be ready to ship out the next day.